Our Future Rooted in Our Past: What Do Text Messages and Cemeteries have in Common? What Do Text Messages and Cemeteries have in Common? As texting is taking over the communications of the young and old alike, you may be wondering what text messages would have in common with Cemeteries. 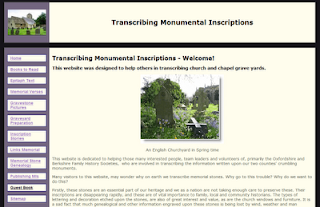 I found Transcribing Monumental Inscriptions, a website designed to assisting others in transcribing cemeteries. This site is dedicated to the instruction of helping others learn the better ways to transcribe cemeteries, the reason for transcribing a cemetery, common abbreviations to use when transcribing cemeteries, ie. wid = Widow/Widower or IRO (In Remembrance Of) and how to publish the data once it is collected. These abbreviations or acronyms make it easier to remember what a memorial stone said without having to write the entire epitaph. Recording of a cemetery would be a great Eagle Project or Service Project. As we remember those who have come before us, we will be able to understand our past and protect our future. If we can assist in taking care of the memorial stones, we are preserving the past for our future descendants. If you would like to read futher about how to record a cemetery, or would like to read some epitaphs (some are humorus) or learn how to publish the cemetery records you have already indexed, click Transcribing Monumental Inscriptions.